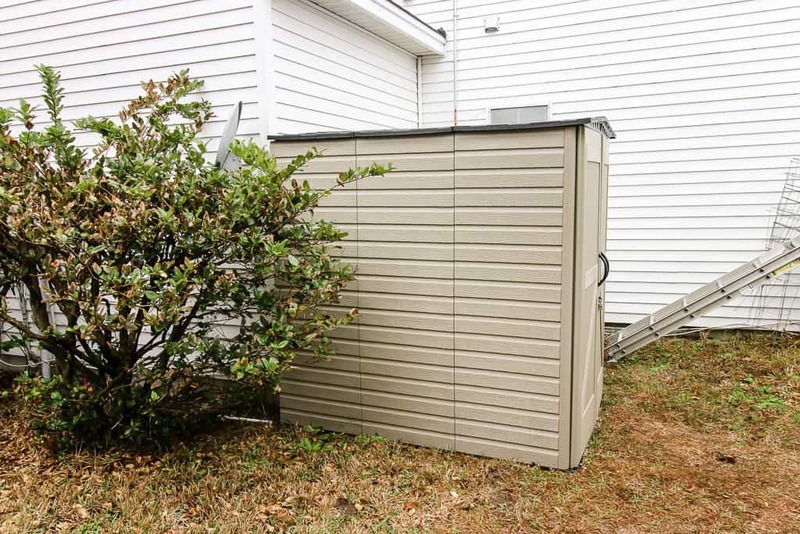 Considering a Rubbermaid shed? 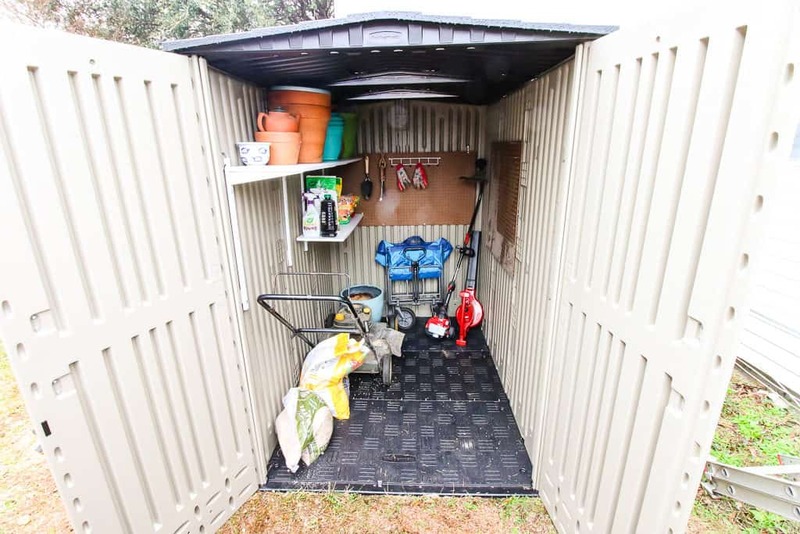 We got the Roughneck Storage Shed – here’s all the details and our review! We have a two-car garage and an attic. That should be plenty of storage, right? Except, it’s not. We have a whole workbench setup in our garage, which takes up a bit of space. We also have a ping pong table! While we have space for 2 cars technically, it leaves zero room for even walking around. 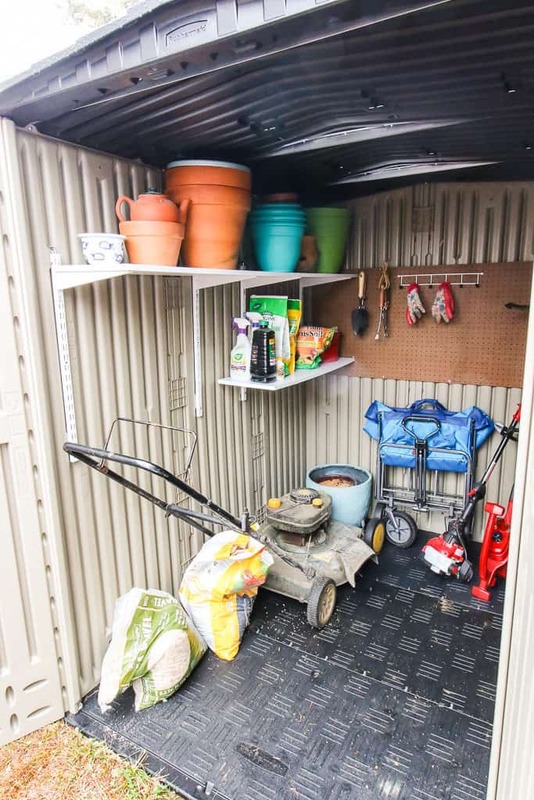 We plan on doing a full garage organization spree this year, and step 1 was getting some of the larger outdoor items (like the lawn mower) out of this space. 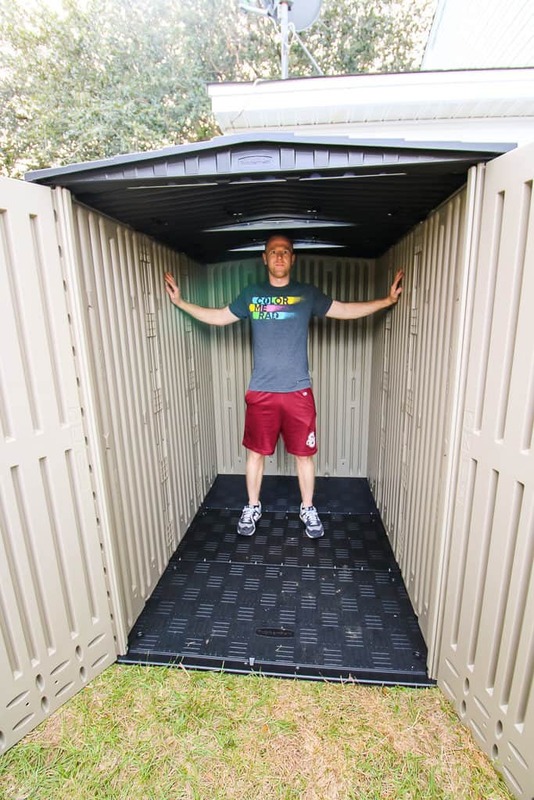 So, we wanted to share why we got a Rubbermaid Roughneck Storage Shed and our review of it. We needed a place to put all of our outdoor supplies in one spot and we figured a shed outdoors would be the best place for that. It was important to get something big enough to fit all of our outdoor power equipment, pots, gardening tools, dirt, etc. I wanted something maintenance free so I was really interested in a plastic shed. I love the material of this shed and how weather resistant it is. We live in a very humid area and we needed something heavy duty that would last! We opted for the 5×6 large Rubbermaid Roughneck Storage Shed because that was the only one that could fit the lawn mower. 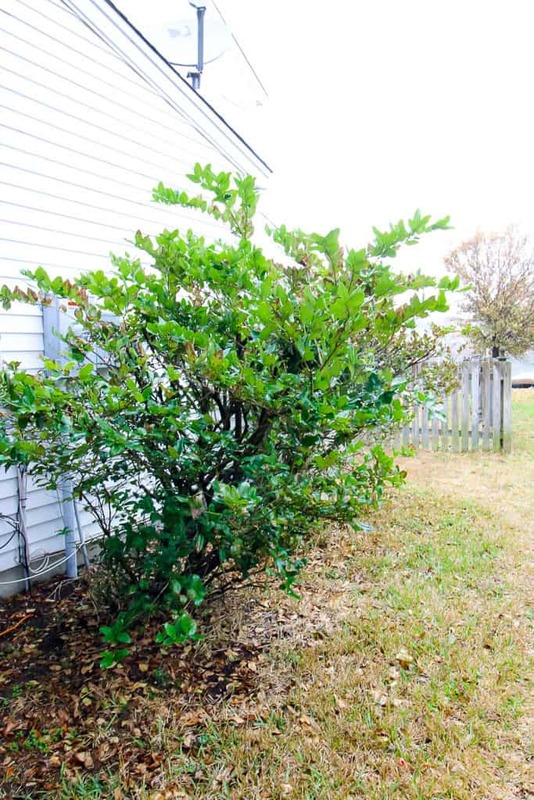 Sean was a little skeptical at first that it would be too big and obvious, but it is tucked behind the garage and a bush and you can’t see it from the front. When we picked it up at our local store, it was so much bigger than we anticipated. We had ordered it online with in-store pickup, so we didn’t know the size of the box and holy moly. It took four people to lift it into the back of Sean’s truck. The two of us were able to slide it out and onto the ground and then we just had to carry it piece by piece to the back yard. Luckily, each panel is plastic and not heavy at all. Assembly was a breeze. The instructions were extremely easy to follow and went step-by-step with each piece properly labeled. We won’t bore you with the how-to setup because the instructions are seriously easy to follow. The entire thing took less than an hour and the space was big enough for a yoga studio. We customized our shed by adding shelving and pegboard that we cut to size. The shed is plenty large for a few rows of shelves, pegs and stuff on the ground. The only thing to remember when customizing with accessories is to make sure you can still get in there and move around, otherwise you won’t use it to it’s full potential. 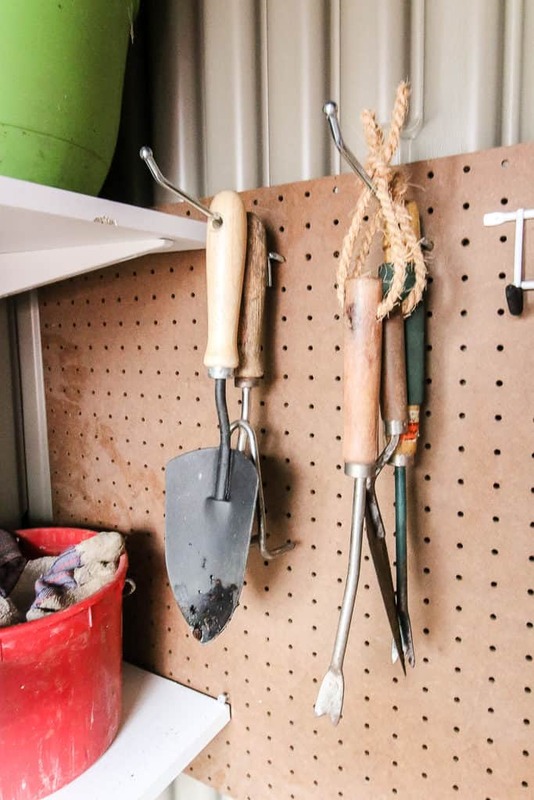 The double walled construction of the shed makes it possible to mount hooks or shelves without them being visible from the outside of the shed. 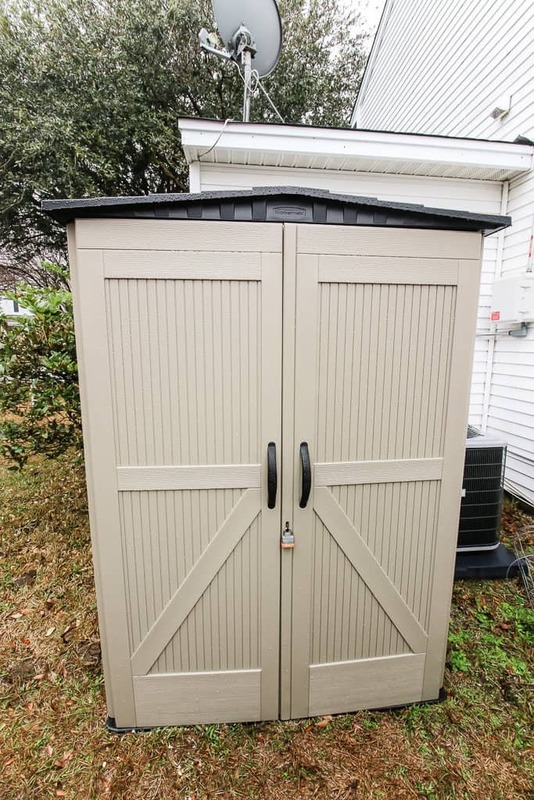 We’re loving our Rubbermaid Roughneck Storage Shed so far and can’t wait to use it more in the spring. It is five feet from our vegetable garden, which will make things very convenient for working in there. We’ll also be able to keep all our outdoor equipment right outdoors and can access it with ease. Also, because people have asked, it is really well hidden by the bushes on the side of our house, as you can see below. Note: this post was not sponsored. We bought the shed full price (minus a coupon) from Lowe’s. This is an honest review. This post contains affiliate links, meaning that if you click through and make a purchase, we receive a small percentage of the sale. 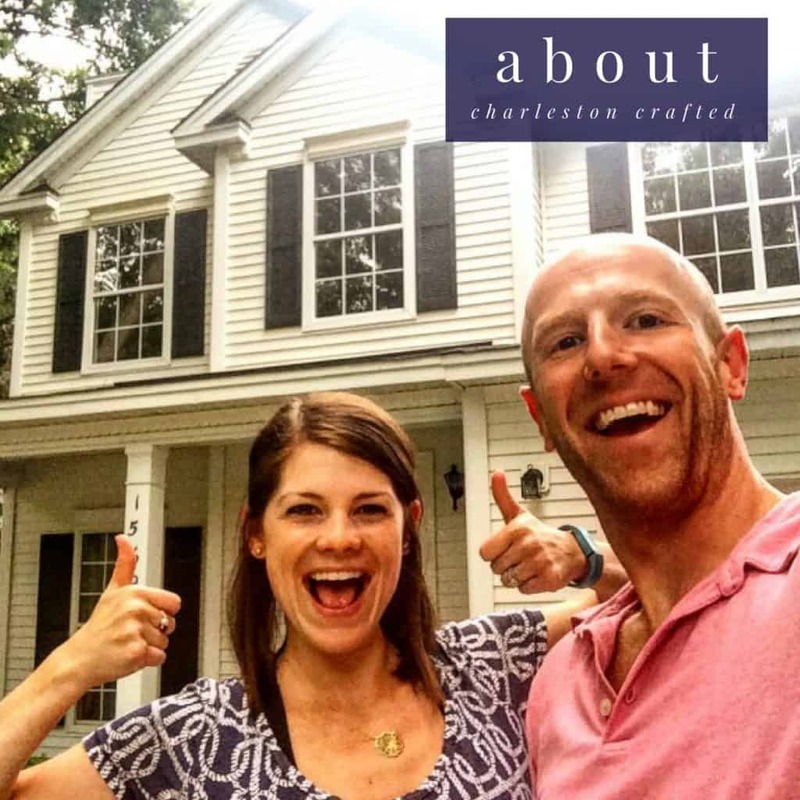 Thanks for supporting Charleston Crafted! Do you have a shed? 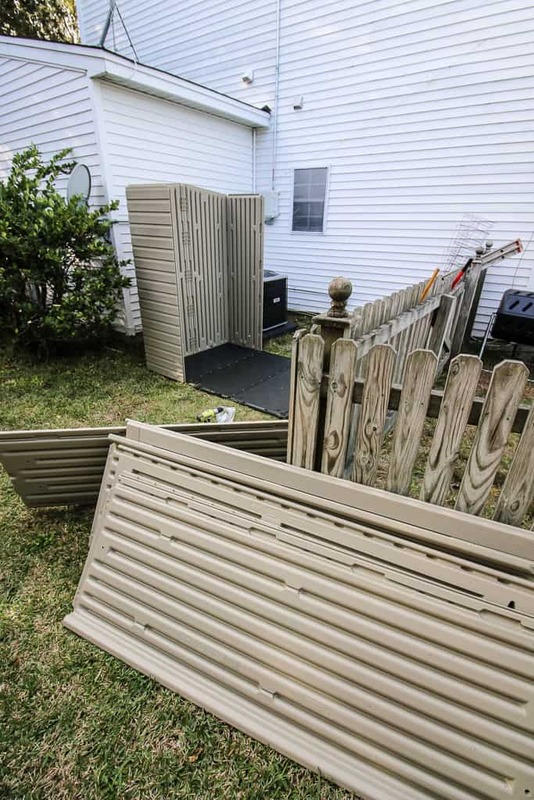 How do you handle outdoor storage? Just a head’s up….I bought one of these about five years ago and while it has mostly held up over time, the doors easily pop off making the lock on the front kinda pointless….with that said, mine sits out in the open and (knock on wood) no one has gotten in to it…..I think it has slightly warped over the years.